So today we had Andrew's birthday party and I must say it turned out much better than I thought it would. First off it's been calling for rain today all week and I was worried about what I was going to do. Some of the games I had planned could only be done outside (including a pinata) so I've been frantic all week trying to find a way to move it all indoors. Second, when we picked up the cake last night the idiot woman at the bakery decorated it the wrong way. Fortunately we were still able to make it work and it turned out very cute. When we woke up this morning it was pouring down rain so of course I went to work on getting things ready to have the party inside. Then I went to the store to have the balloons blown up and of course they were out of helium. Thankfully I got to one of the local florists right before she closed and she did it for me. Finally around 12 the rain stopped and the sun came out. This is when things started to turn around. By 3:30 when the party started the yard had dried out and was ready for kids to play. Everyone seemed to really have a good time. We were lucky enough to have some friends come to the party that we haven't seen in a while. It was great sitting around catching up with them while the kids played. What originally looked like it was going to be a bad day turned out into a great day for everyone. On another note we got some new news this week about Adam's deployment. Apparently Adam's unit has been completely removed from the current deployment roster. This means that as of right now he shouldn't deploy for at least another year. Now as always this is subject to change at any time however it's still very good news. Maybe now Adam will be here for 2 Christmas' in a row and even two of Andrew's birthday's. Below are a few pictures from today. Hope you enjoy!! 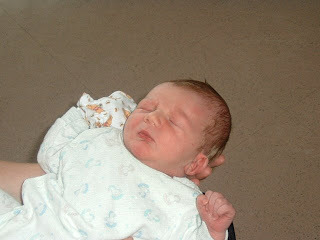 I can hardly believe that my little baby turned 4 years old today. It seems like just yesterday that he was born and I was trying to figure out why the people in the hospital felt that I was qualified to take him home unsupervised. At the same time it feels like I've been a mom forever. I can barely remember a time that we didn't have this precious little boy and as much as he drives me nuts on a daily basis I wouldn't give him up for the world. Of course looking back now I should have known he was going to be a challenging kid. I mean I had contractions starting at 6 1/2 months. They continued off and on for the next 2 months to the degree that my OB suggested that the Army bring Adam home about a month early from Afghanistan because they didn't think I would make it to my due day of May 5. However Andrew had his own agenda because as soon as Adam got home the contractions stopped and I ended up being almost 2 weeks overdue before they induced. Somethings never change because Andrew still has his own agenda and only wants to do things his way and when he wants to do them. Andrew's 1st birthday party & being stubborn once again. He was sooo close to walking so of course when my parents said they were coming to NY for his birthday we were hoping that would be the week he took his first steps. Well of course he didn't, while they were at our house. In true Andrew style he waited until they had been gone about 2hrs to head back to AR and he took off across the room with no help. They tried so hard while visiting to get him to walk but the stubborn little man had to do it under his own terms as usual. 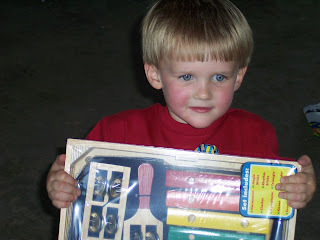 His second birthday was the first "big family party". We had just moved down to AR while Adam was deployed so it was good to be able to have all of the family around to celebrate with us. It actually worked out well since his birthday that year fell directly on Mother's Day. We were able to have the usual Mother's Day get together and a birthday party at the same time. Going home for that 15months was one of the best decisions I could have made for us. It was great for the family to be around to see him grow. I was amazed at how much he changed during that time. He went from being a baby to an actual little boy. 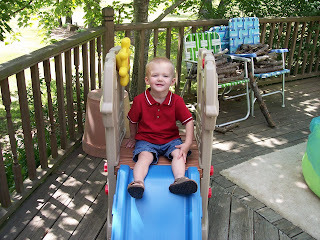 This picture is from his 3 birthday at the park in Searcy. Can you tell he's a little hot? It was kind of a bittersweet birthday for me. Adam missed his birthday by just a few weeks due to the deployment extension. This was actually the first birthday Andrew understood what was going on and was super excited about everything. It was a lot of fun watching him open presents and blow out his candle. This last picture was taken this evening before we went to Andrew's school Fine Arts Festival. They had art from all of the kids on the wall in the gym and then each class preformed a few songs. The pre-school & pre-k classes did The Hokey Pokey & This Little Light of Mine. It was adorable and all of the kids looked like they had so much fun. Unfortunately I didn't get any good pictures. They turned out really dark so I'm not going to post them on here. Trust me though it was too cute for words. I'll try and get some party pics on here sometime the first of June. Since Adam is gone all of this month training we are waiting to have the party until the 31st when he's back. It was so odd looking back at all of these pictures. Especially the ones from the day he was born. While it doesn't feel like it's been 4yrs since Andrew was born, I really have a hard time remembering what he was like that little. Back before he could walk, talk and drive me insane. There are days when I would love to have that little baby back in my arms again, but at the same time I can't wait to see how much more he's going to grow and what kind of a person he's going to become. Only time will tell what the future holds in store for my precious boy. I know that I am truly blessed to have him in my life. On Saturday we went to Andrew's school fundraising carnival with our friends Jessica & Zander. It really was a lot of fun. The boys had a blast as you can see in the pictures I have posted. I was very proud of Andrew for not crying on the rides that went up into the air. Last time they had to stop it in the middle of the ride in order to let him off because he was scared. This time was very different. We had a hard time getting them to leave once we ran out of tickets and money. I hate that Adam had to miss it though. He's never seen Andrew on carnival or fair rides, but as always I took plenty of pictures for him to see. As I'm sure everyone knows Mother's Day was yesterday. I hope all of you Mom's out there had a wonderful day. Personally I can't say that this day was especially different than any other. That could have to do with the fact that Adam is still gone and Andrew is still to young to realize what's going on. Ever since I've been a Mom this day has been slightly overshadowed by Andrew's birthday since they are only a few days apart. When I was pregnant I prayed that he would be here by Mother's Day, but of course Andrew did what he wanted and came 2 weeks past my due date. His 2nd birthday actually fell on Mother's Day and now this year it is this coming Wednesday. I love being a mother, although I must admit somedays it's much more challenging and frustrating than I ever thought it would be. Raising a "stong willed" child tries every ounce of my patience on a daily basis, but I wouldn't trade him for the world. I know how blessed I am to have him and that his strong defiant personality will someday make him into a person that will accomplish great things. I also know that his personality will help to make me a better person. I really hope this post is coming across the way I am intending it to. I have a feeling that some won't understand what I am trying to say, but I suppose there isn't anything I can do about that. So to all of you Mothers out there I hope that you continue to feel special and appreciated every day, becase you are. Adam has now been gone for 6 days and it feels like SOOOOOO much longer. Really things haven't been THAT bad, but it's also still early. Andrew has had a few moments of being a nightmare of a child but all things considered he's doing much better than he was a month ago. I think this is probably going to be the longest summer of my life. Once Adam gets back from LA (Louisiana) he will be here for about a month and then we travel down to AR to visit with family. Andrew and I will then fly back to NY and Adam will head further south to San Antonio and will be there until the first week of Sept. That isn't much family time over the course of the summer not to mention his unit is still slotted to deploy again in November. Sometimes I wonder if the Army life really is the best thing for us. It keep us apart more than I would like and also cause Adam to miss so many things in Andrew's life. I've given up on him being here for birthdays because I don't see that happening again for at least another year or so. However next week is Andrew's first school music program and he's going to miss it. Yes I know that's what they make video cameras for, but it's not the same. I know these are just trivial things, but it still isn't fair. Don't get me wrong I greatly appreciate everything my husband does for us and for his country. His sacrifices make it possible for me to be a stay at home mom and I wouldn't trade that for anything (despite what I might say in moments of anger and stress). On another note Andrew's school is having a fundraising carnival this weekend so I'll have some pictures to post next week. This is one of the flower boxes on the front of the house. I realize this isn't a very good picture but due to the bushes in front of them it's hard to get a good shot from a distance. Now on to the title of this blog. Right about now Adam is boarding a flight to Fort Polk, LA for training. They will be gone until around the 26th (we don't have an exact return date yet). The last time Adam was gone for a few days due to training Andrew did not deal with it very well. He had several tantrums and was generally hard to deal with. I'm hoping this month will go fairly smoothly. As much as I hate that Adam had to go this is actually going to be a good thing for us. I'm looking at it as a stepping stone for the deployment to Iraq this fall. It gives Andrew a chance to adjust and realize that even though Daddy may be gone for a while he is going to be home eventually. With him being gone this month it also means that he will miss Andrew's birthday (again). However since all of our friends are gone to the same training we won't be having his party until the weekend of the 31st. I doubt Andrew will know the difference. Actually he will get to have 2 parties, one at school and then his party here at the house. Below are some pictures from today. He is starting to really enjoy playing his Click Start computer game that Nana & Pawpaw got him for Christmas. Mom please stop taking pictures of me! !